After the success of the NEX APS-C models, Sony has introduced the EVF-equipped 20-Mpix A3000 to compete with similar mirrorless models from Panasonic and Samsung. Read on to find out how this entry-level model performs. Data for latest Sony DSLR A850 now available. Read the review. Data for 3 other Sony cameras the A230, A330, A380 also available. Sony was the first brand to deliver a very high resolution full-frame camera with the Sony Alpha 900. 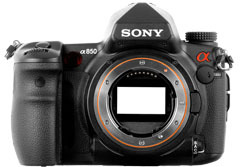 They now add the Sony Alpha 850. Although this is a new camera, it has the same resolution, the same body, and the same ISP as the Sony Alpha 900. In short, the announced differences seem very slight between these two twins.